The University of the Philippines Diliman, through UP Biology was the recipient of a donation of 1000 copies of a book through the Diliman Science Research Foundation (DSRF), chaired by the College of Science Dean Jose Maria P. Balmaceda and the Philippine Tropical Forest Conservation Foundation (PTFCF) for distribution to critical stakeholders in Luzon and the rest of the country. 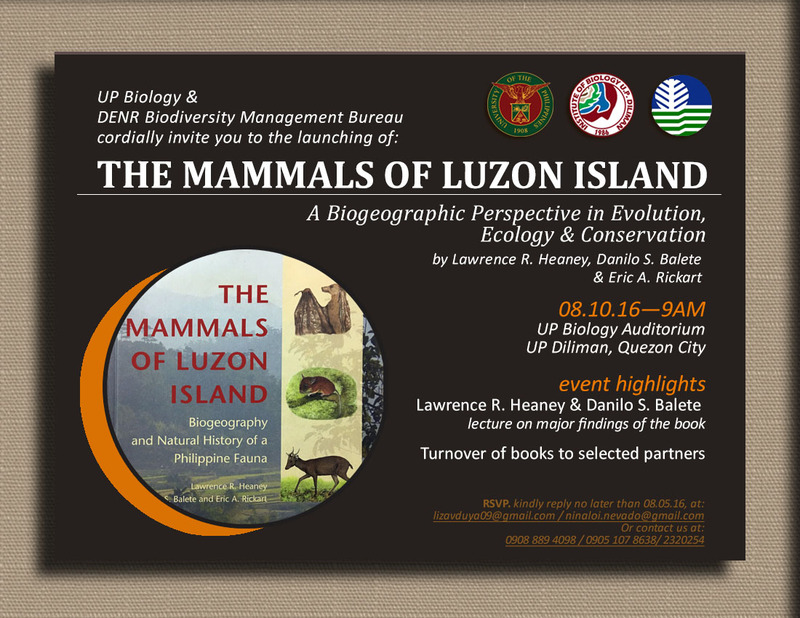 The book “The Mammals of Luzon Island: A Biogeographic Perspective on Evolution, Ecology, and Conservation” was written by Lawrence R. Heaney, Danilo S. Balete and Eric A. Rickart, published by The Johns Hopkins University Press and released only last April 2016 in the United States. 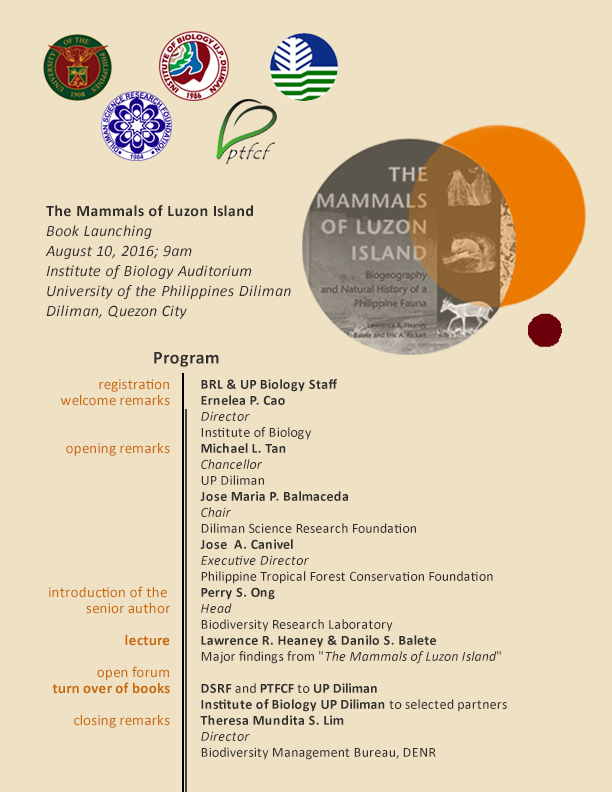 Together with the senior author of the book, Dr. Lawrence R. Heaney, UP Biology will launch the said book on 10 August 2016 (Wednesday), 9am, at the UP Biology Auditorium, UP Diliman, Quezon City. The book is the result of Dr. Heaney’s more than 35 years of extensive research on Philippine Mammals in various parts of the Philippine Archipelago, with the last 16 years focused on Luzon Island. All throughout Dr. Heaney’s research endeavors in the Philippines, he worked closely with UP BIOLOGY and other units in as well as the Department of Environment and Natural Resources (DENR), specifically the Biodiversity Management Bureau (BMB). Through this research partnership, and working with the BMB-DENR, the local government units and the local communities where his team worked, significant findings were made which are reported in the book possible. The major findings from his work demonstrate how unique and precious Philippine Biodiversity is, its role in understanding biogeographic patterns and processes and its contributions to evolutionary studies. From 28 species of non-flying small mammals known in Luzon Island when they started their research, this was doubled to 56 species at the end of 2015, which includes earthworm mice and giant cloud rats. Of these, 52 species of these (93%) are found nowhere else in the world. These findings placed the Philippines, particularly Luzon Island, as the place where the greatest concentration of mammals can be found as well as an important center for evolutionary studies, the understanding of biogeography and how these should guide conservation actions in the Philippines and elsewhere. The book also highlights the need to protect tropical forests in the country as this highly endemic mammal assemblage is mostly forest dependent. His body of work is considered a major contribution in the area of biogeography, ecology and evolution, which were pioneered by Alfred Russell Wallace, Charles Darwin, Robert MacArthur and Edward O. Wilson. Dr. Heaney is the Negaunee Curator of Mammals at the Field Museum of Natural History in Chicago, Illinois. He has spent more than half of his adult life in the Philippines, doing research and in the training Filipino wildlife biologists. DR. HEANEY also played a crucial role in the establishment of the Wildlife Conservation Society of the Philippines (WCSP) in 1992. UP Diliman Chancellor Michael L. Tan, College of Science Dean Balmaceda and UP Biology Direcotr Ernelea P. Cao, together with Dr. Heaney, will leave the turn-over of the books to selected stakeholders such as other units of CS, other units within UPD, other units within the UP System, other academic institutions, the DENR, specifically the Biodiversity Management Bureau and other government agencies, civil society organizations, local government units. For further information about the book launching, please contact Ms. Nina Loi Nevado through her email ([email protected]m) or through landline no. 232 0254.